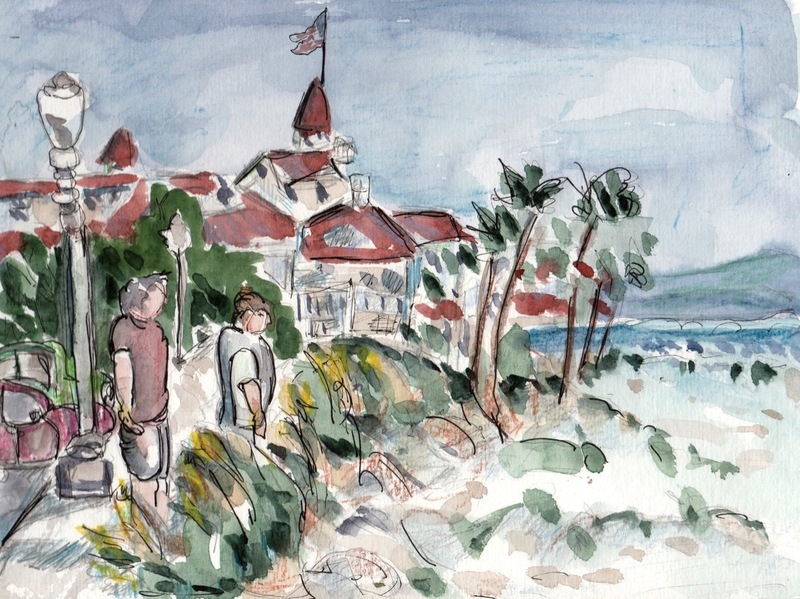 The San Diego Urban Sketchers met today to sketch the historic Hotel del Coronado, just across the bay from San Diego. There were so many possibilities for this sketch. I walked around a bit and decided to sketch a view from the north side that included both the hotel and the beach. I probably would have done better to simplify the composition. It got kind of busy and I just kept adding in more. I wanted it to convey a story and for me this means I need people, so in they went and now I can’t tell if this is a sketch about a hotel or a sketch about two people. I may go back and try again soon on a much larger size of paper. I used pen, pencil, watercolor pencil and watercolor. This entry was posted in Uncategorized and tagged San Diego Urban Sketchers, Urban Sketching. Bookmark the permalink.